Electric tillers, more properly referred to as electric cultivators, are designed to be used differently from tillers. Unlike gas-powered tillers, which break into and churn hard soil into a workable garden bed, electric tillers are less powerful and feature smaller tines. 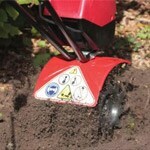 So why might you want to choose an electric tiller over a larger gas-powered tiller? There are a number of reasons to use them, and knowing those reasons will help you to differentiate them from gas-powered models. Electric tillers are used for stirring in amendments and further churning already tilled soil to a softer, less dense consistency for better root development and easier planting. They have smaller, tighter tines that break soil into smaller clumps so you can easily rake the soil around with your hands as you sow seeds or plant bulbs. They feature enough speed to break through this already loosened soil, but they lack the torque and sheer power necessary to break into hard, compacted soil. For that reason, electric tillers are not the ideal tool for establishing new gardens, but are effective for weeding, aerating, and stirring in compost or other amendments to maintain the soil's optimal condition for growing. If you'd like a tiller for your small raised-bed garden or flower beds around your town home, and you've got limited storage space, an electric tiller might be the perfect choice. While they're not designed for large area or heavy duty jobs, electric tillers can be quite effective for maintaining flower beds or a small personal garden in your back yard. If this is primarily the kind of work you'll be doing, these electric models should be able to meet your needs. And since electric tillers don't have the weight and bulk of a gas engine, they're lighter weight and smaller in size. They can typically be folded for easier storage, and there are no gas fumes or oil leaks to be concerned with. So if you've got little storage space to work with, an electric tiller will be much easier to stow away than a larger, heavier, and messier gas-powered tiller. 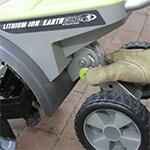 With gas-powered tillers and cultivators, there is more maintenance involved. As with any gasoline-powered equipment, you'll be responsible for oil changes, gasoline storage, filter changes, and fuel treatment during storage. Electric tillers have no gasoline to treat and no oil to change. There may be air filters to clean or replace periodically, but that's it. If you don't have a garage or shed for storing your tiller, and must store it indoors, electric tillers won't give off gas fumes. Gasoline-powered tillers, even when not in operation, will still vent gasoline fumes into the indoor air. Electric tillers are much cleaner and easier to store and take care of, so they're generally the better option for owners of small homes. 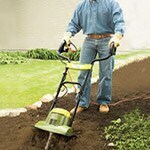 If you've got a lot of tilling or cultivating to do in one main area, you may want to choose a corded electric model. Corded electric tillers will not run out of power unless your electrical service is shut off (let's hope that doesn't happen). 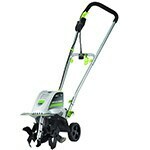 They can handle larger tasks than a cordless model due to their continuous power source. The only downside to corded models is that they're restricted by the cord itself. If you've got several small areas to cultivate around your property, and would rather not be restricted by an extension cord, there are cordless models that will allow you to move around unrestricted, but your running time will be limited by the life of the battery. You can invest in more batteries and easily switch them out to keep going, but if you're looking for uninterrupted continuous power, you're better off with a corded electric tiller. Why to Choose an Electric Tiller.. Our Power Equipment Direct how-to library can help you learn about How to Grow Crops with Raised Rows or Beds, Proposition 65 Product Labeling and Sales Tax Information.